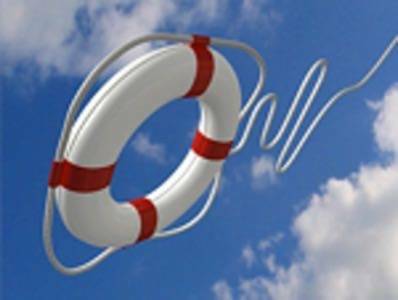 Remember your father’s disaster recovery (DR) process? Chances are it involved using a bunch of data tapes and rotating them between home and work, or different offices. Tapes were cheap, but notoriously unreliable. And getting them restored on a server took a lot of work. There are better solutions for today’s DR, including using one of a number of newer virtualization technologies that makes it easier and a lot faster to bring up a server from a backup. Let’s look at some of the alternatives. Virtualization can help with speeding up recovery time, because it is easier to start up a virtual machine on a hypervisor such as VMware’s ESX than rebuild a physical server from scratch. With one IT shop, before virtualization, it took 48 hours and 12 staff people to recover systems. After virtualization, the process can be completed in 24 hours with four staffers, and most of the time those workers are just monitoring their systems to make sure that everything is operating properly. But it still isn’t a complete cakewalk. For example, VMware has a collection of tools that can convert physical to virtual machines and orchestrate these VMs to step in for downed servers. The company has published a 200-plus-page paper that describes this process on its website. Given the length of the paper, there has got to be a better way. And several smaller, special-purpose vendors have stepped up to provide some interesting solutions. 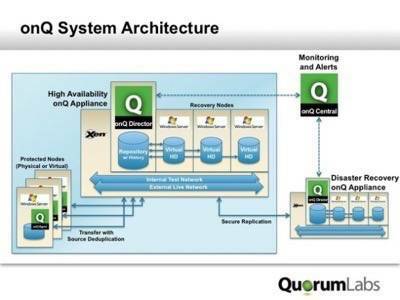 First is Quorum’s onQ Appliance. This is very useful tool for DR planning.  You use two appliances: One sits on your network and the other sits at your offsite location. onQ makes virtual machine copies of all of your Windows server collection, both existing physical servers as well as those VMs that you are running. When disaster strikes, a single click can activate the VM and have it substitute for the downed physical server in a matter of seconds. The nice thing about the onQ solution is that you can avoid creating a duplicate data center where you have a copy of all your gear. These appliances aren’t cheap: Prices start at $10,000 per appliance, and cover three servers. Additional servers and a quickstart installation are extra. But onQ can handle a mix of both physical and virtual servers, as long as they are all Windows machines. It can combine both onsite and offsite recovery, and you can do daily DR testing too. This kind of flexibility is helpful to handle a wide variety of DR situations. 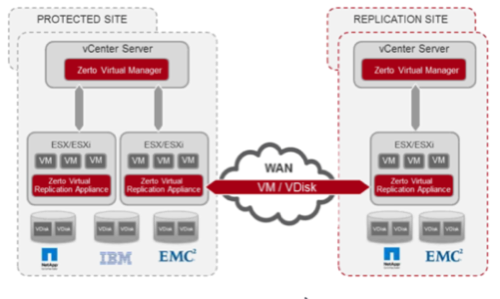 A second product is from Zerto called Virtual Replication. It is used to protect just your virtual infrastructure running on VMware. There are plug-ins for vSphere and it is managed using the VMware vCenter tools. Agents need to be installed on each hypervisor and there is also a virtual appliance that has to run on each hypervisor too. Like onQ, you can do quick and frequent tests of the DR plan to ensure that things are protected. It costs $745 per protected VM, with a minimum order of 15 VMs. Zerto recently came out with v2 of the product which supports multi-tenants and multiple site replication. Backup Exec has a SMB edition that starts at $1,163 for a single server. There are other DR products that combine virtualization elements, such as Axcient and Datto. As you can see, this is an active field and you can expect more players soon. N.B. I have done some consulting for both Symantec and Quorum Labs in the past year.